The nearly 500 athletes start their 120-mile TransRockies Run in the brilliant Colorado sun. 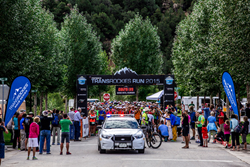 The 2016 TransRockies Run will celebrate its 10-year anniversary with an enhanced media presence and nationally televised broadcast of its annual race through the Colorado Rockies. While the daily struggles and celebrations of these committed trail runners have been shared primarily within the TransRockies Run community, this 10th running will be featured on CBS Sports Network in late summer thanks to the recently formed partnership with Emerging Sports TV’s principals Kirk Montgomery and John Duesler. For six days in August, nearly 500 athletes from 16 nations will endeavor across the Colorado Rockies covering 120 miles throughout the trek. Race director Aaron McConnell has produced this event since its inception and has enjoyed TRR’s reputation as the premier trail running stage race in North America, sponsored by leading national companies such as Gore-Tex, PepsiCo, and Gatorade. The 2016 TransRockies Run will begin in Buena Vista, Colorado where athletes will make their first 20-mile run. During the remaining five days, participants will again traverse on average 20-mile segments each day, stopping at historic towns along the Colorado Rockies’, such as Leadville, Red Cliff, and Vail, until their last stop on the sixth day at Beaver Creek. Emerging Sports TV will be covering the 120-mile, six-day excursion as part of their 2016 broadcast series on CBS Sports Network that reaches 96 million cable TV households. For more information on sponsoring this iconic endurance sports event or becoming a broadcast partner, please contact Cynthia Bruggeman by email or phone: cynthia(at)speckled-hound(dot)com; 970-470-4489 (office); 970.445.0599 (mobile). You can also download the event Ad Deck HERE. About the TransRockies Race Series: In operation for 15 years, the TransRockies Race Series brings together some of the most unique and iconic off-road endurance events in the world, including Golden 24, Rundle’s Revenge, ATB Financial Gran Fondo Highwood Pass, Singletrack 6, TransRockies Run, and Moab Rocks. Operating in Canada and the United States, TransRockies Race Series annually attracts over 2,500 participants from 20 plus countries each year for fully supported destination events that are rugged and authentic. About Emerging Sports TV: Emerging Sports TV is the broadcast outlet for a number of national and world championship events, as well as other world-class sports. Using our potent television distribution, livestreaming technologies, and other digital platforms, Emerging Sports TV’s coverage has included an impressive resume of events, including the US Curling National Championships, the Pikes Peak International Hill Climb, Slacklining at the GoPro Mountain Games, disc golf, snowshoeing, as well as the La Ruta Adventure Race in Costa Rica. Emerging Sports TV reaches 99 million+ cable TV household subscribers via regional sports affiliates, as well as networks, such as the CBS Sports Network.